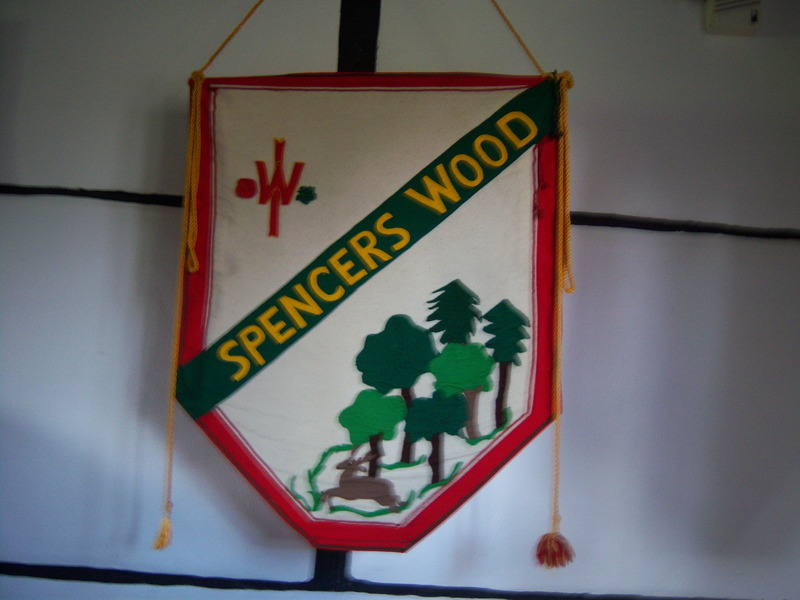 This month’s article is loosely connected with Spencers Wood in that it recalls the Body family who influenced Shinfield from when they first moved here in the 1600’s. 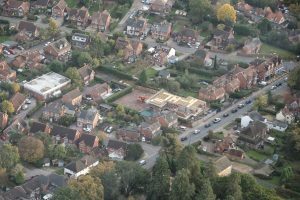 Recently, in March, Sir Richard Body, the MP, who lived in Stanford Dingley, Berkshire, died and his obituary revealed his ancestral connections here. His ancestors moved to Shinfield in the 1600’s and the name of either Richard or Bernard has continued ever since. There are 30 members of the family buried in a vault in St Mary’s Church, Shinfield. Two ancestors have left legacies in the form of charities. One of them named The Richard Body Charity, a charity for the poor of the parish and the other The Bernard Richard Body Charitable Trust used to maintain the church. The Body family owned Hyde End farm, the Mill House and Great Lea House Farm amongst other properties. The latter was part of an article written earlier by the group. This house was sold to Berkshire County Council in the 1920’s by the grandfather of the above Richard Body. Richard’s great great grandfather had built it in 1822 and this Richard in the 1970’s, tried to save it from being demolished to make way for the Swallowfield bypass by buying it from the Council and having it rebuilt in Grazeley, two miles away. Body’s farm is still on the Basingstoke Road, in Spencers Wood. Some background to the late Sir Richard Body is that he was MP for Boston and Skegness lately and entered politics in 1955 as the Conservative member for Billericay. He was educated locally at Reading School and when he was 50 took his O level in English to test the standard of education of that day. He gained a C pass and concluded that standards hadn’t deteriorated at all! He said that in 1955, MP’s would traditionally wear striped pants and black coats as per Clement Attlee. He grew up in Shinfield and his father was a cavalryman in the Life Guards who fought in both WWi and WWII when in his fifties. His mother drove ambulances during the war. When war broke out the house was sold and all the animals shot. Sir Richard was a pig farmer who cared about the welfare of animals, including mink. He was also a huntsman and kept a pack of hounds. He was a barrister in family law for his income essentially and he gave up parliament to concentrate on the law but returned. Sir Richard was initially a Conservative but became a UKIP member as he was a staunch Eurosceptic when he died. There is so much more that could be said of him and some of the above comes from his oral history in the British Library which came from directly from him. An interesting individual. Where was this picture taken? Who are these bunch of lads? Geoff Day donated it to our group (far left standing). He’s also in our most recent book, as a member of Fire Brigade stationed at Highlands (see p 163) and we also have captured his wedding to Alice Marcham in 1936/7 at St Michaels & All Angels Church (see p 130) – donated by Irene Elliott. What are these boys doing? Were you part of this group? Were you the one legged chap? We spent lots of time yesterday at our meeting discussing hats, coat styles, arm bands, and guessed at timelines for when this was taken. We would love to have answers! Celebrations & New Book Launch! 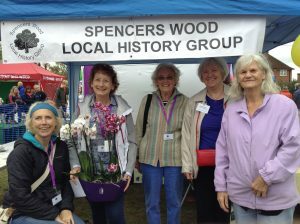 This is the seventh year that I have been involved in the Spencers Wood Local Group and supported the Carnival. I joined the group at the Carnival eight years ago! It was also our 20th anniversary, and the group has grown so much. 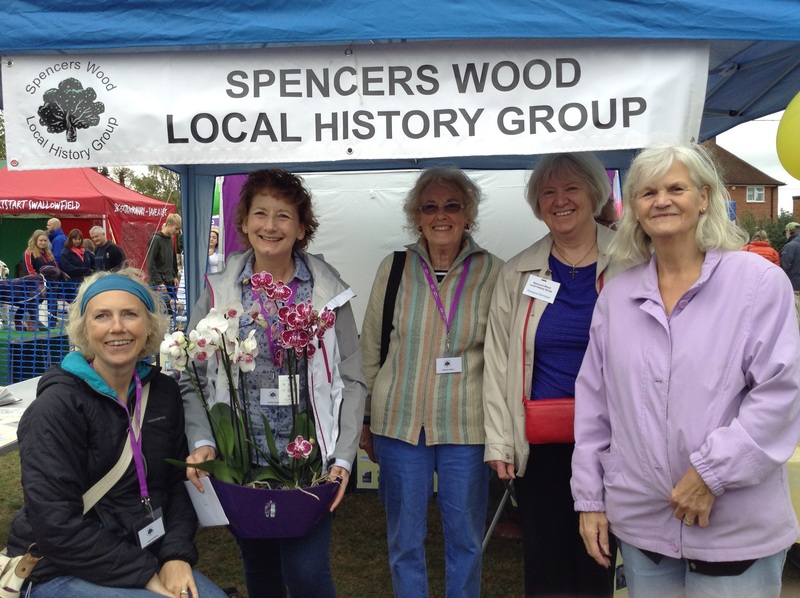 Margaret wrote eloquently about the group’s achievements over the years in last month’s Loddon Reach, and if you missed it, you can find it on the Blog page on our web site – www.swlhg.co.uk. Finally, this year was a special birthday for one of our members too: hence the orchids in the picture! 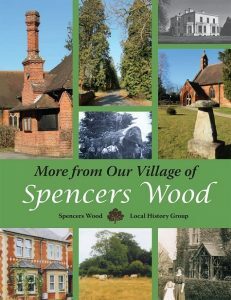 We had interest in the new book (More from Our Village of Spencers Wood) from many people, as well as information from others about where to find historical imagery of local properties (Reading Library/Records Office) and our other publications. Our children’s history box always goes down well, with coin rubbing, and Lesley telling children stories of milk being delivered by horse and cart, showing horseshoes, and cricket caps and jumpers! There was a brilliant fairground, and Morris dancers whose bells you could hear from afar! 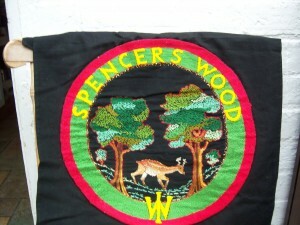 We are very pleased to announce the dates for the official launch of More from Our Village of Spencers Wood. This will be held on the evening of Wednesday 7th December at St Michael & All Angels Church from 6pm to 8pm. 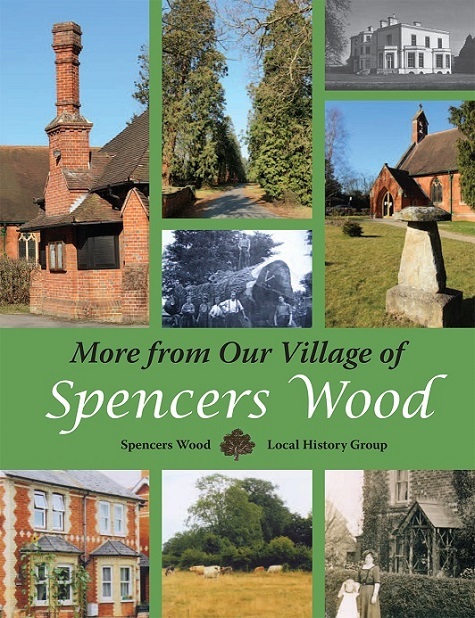 The Speaker will be Professor Richard Hoyle who will give a short talk about the history of Spencers Wood, and the Reverend Marion Pyke (who grew up in the area) will be presented with the first copy of the book! There will be a permanent display in the Church (during their opening hours) in the week of 5th December, with a member of our group selling copies of the book. 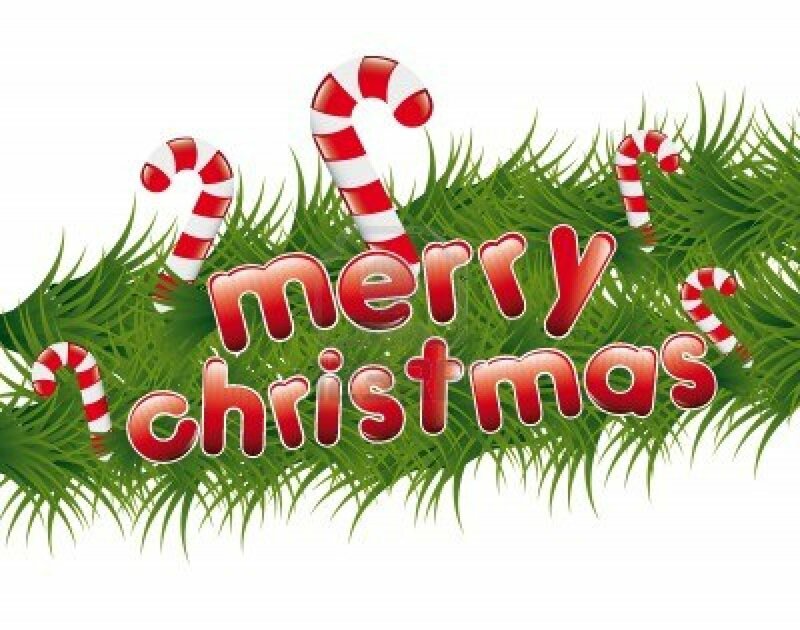 Books will be sold from Spencers Wood Library on Thursday 8th December from 10.00 am, and Friday 9th December books will be sold at the Village Hall from 11 to 1pm. You will also be able to buy the book at all these events, or via our email and website. Mary met a coach which was an hour late and the steeds, driver, carriage and passengers, all one, dust! Mary goes on to say that she liked the current year’s wet season as it kept one in but they were more alive. Everything was doing well. The corn ripened, the grass grew, the fruit was plentiful and fewer wasps. There was no need to water the flowers which flourished. 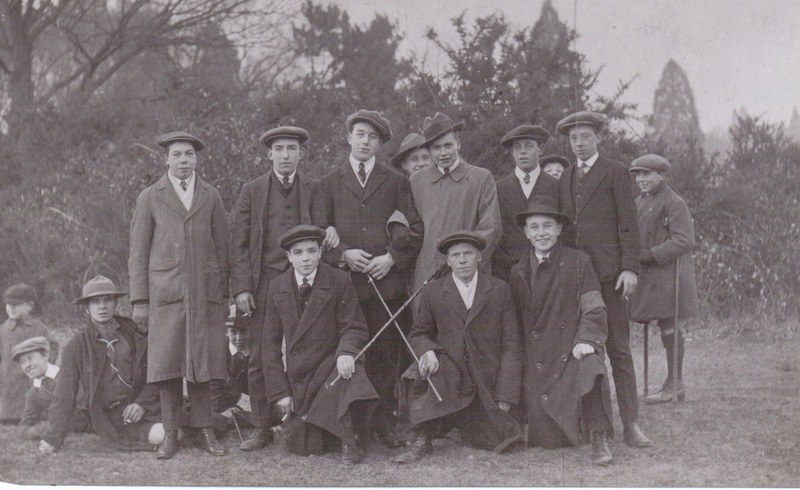 Sometimes the weather cleared and Mary was able to merrily walk up the hill to the common in the evening, enticed by the gay shouts of a dozen, clear, young voices to linger awhile and see the boys play cricket. Half a dozen of the boys would run away to bring chairs from their homes. Mary describes these ‘urchins’, as she calls them and their prowess at cricket, with affection. 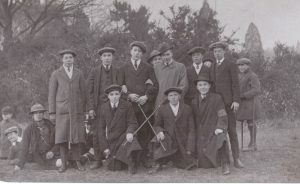 There was Joe Kirby, aged twelve who led the boys, much older than him, at fifteen and sixteen with a merry and happy disposition. She also mentions Joel Brent and Jem Eusden. All the people that she mentions by name are real people with their proper names – it is only the place names that she disguises. Her reason was that people would be proud to have their names in print in Our Village. The sun sets and to delay getting home she walks back via Mr Welles cottage and its’ spring on the corner of the common to the green lane called Woodcock Lane where the elms grow overhead. It was getting late but she wasn’t undeterred because she had the glow worms to guide her. Mary was concerned that the boys didn’t follow her because they so loved to stick them in their hats. 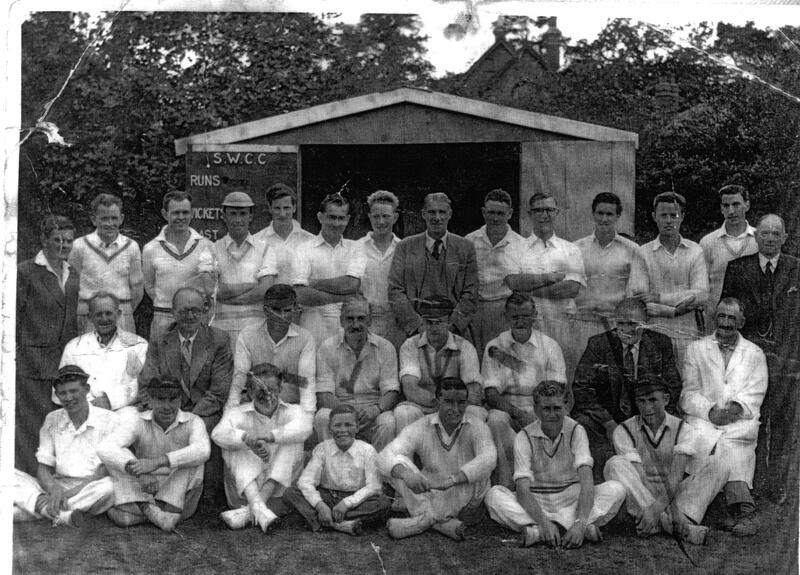 One hundred years later, cricket was still being played at Hill House on the edge of the common, according to Alan Best who lived here in Spencers Wood then. Have you seen all of the web site? And did you know that the group have their own email? 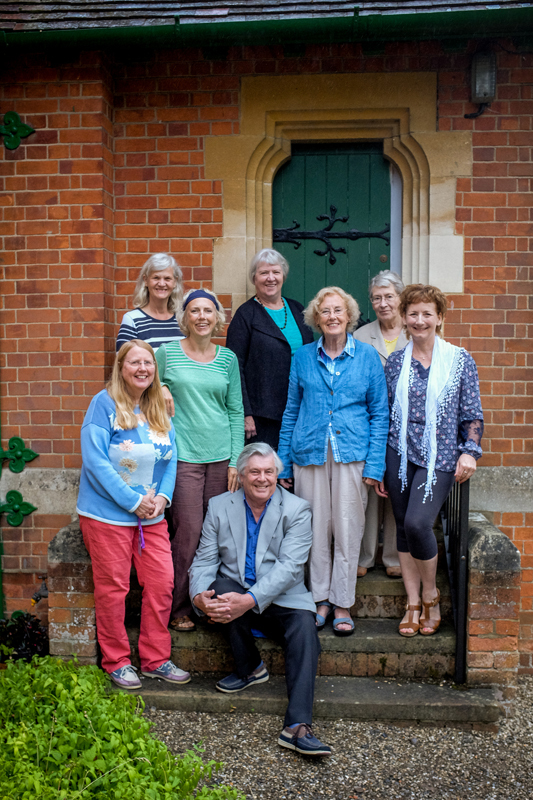 Our group consists of a few members – Barry Boulton, Lesley Rolph, Jackie Blow, Catherine Glover, Mary Wheway, Margaret Bampton, Jeannie Brice, Patricia Green and Sheila Davis. We are primarily a research group, meeting just once a month and more information about how our small group works is in the “about section”. It has taken us quite a while in the research and publication, but we hope it will be worth it. Anticipated publication date is October 2016. There are features on local people through verbally taken histories – have a look and see who you can spot! Trades, shops, census, development and enclosures are also a part of the remit that we hope to continue to investigate once the book has been published. We also have the previous events that were at & the ones will be at this year – Look for our 2016 dates! Since the launch of the site, it has been a real place where the group has gathered information from outside the locality, examples such as contact made from Argentina, Australia, Canada, and Cumbria! One of our original “poster girls” was re-united with her great-nephew, after many years and miles apart. We do seek to include many photographs. Many historical pictures are donated to us at local events for safekeeping, whilst also taking images other ephemera such as deeds, of our own as the environs changes around us. As a group we attend most local events – St Michaels and All Angels Church Fete (Saturday 16th July) and the Spencers Wood Carnival (Saturday 17th September). Whilst we can’t display all of them, we do our best. We were set up to retain the “local” feel of the village, and are very passionate about that. It is so lovely to hear of people that have lived here all of their lives, and we are sharing their stories with individuals that are newly moving into the area. Our books contain many of the villagers memories – thank you for all them, we really couldn’t do them without your lovely contributions! If you find anything you think we should see or if you have some feedback for us, email (spwood.localhistory@googlemail.com) us through our Contacts page. You’ll always get a reply! A Quiz based upon words of the 1720s. What are the meanings of the following words taken from John Watts Memorandum of 1722-3 and 1728-9? 18. WHEN IS ST. MATTHEW’S DAY? For those of you who know Reading and District where were these places in 1720? The answers will be available either by attending the Spencers Wood Carnival, or in next month’s Loddon Reach. Over many years our Group has been involved with St Michaels & All Angels Church either through exhibiting at their Church Fetes, buying their superb tea & cakes at the Caf D’Active or presenting at the Junction club (see article 30 April 2011) which meets there. 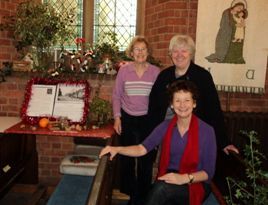 We also often helped at Christmas with decorating the church through putting up local pictures and decorating them. One year we were behind the choir stall. Since December 210 we have started photographically recording our displays. In 2010 our theme was entitled “An Edwardian Christmas” (see article in Loddon Reach January 2011) where we were given a window to dress. 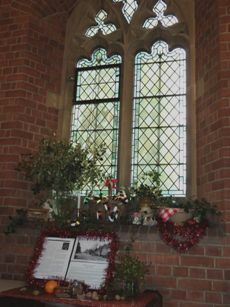 The Edwardian Christmas was inspired by village living and the display reflected this – in addition to the holly and other simple foliage, there was an old fashioned mixing bowl and wooden spoon, various types of nuts and pine cones, jars of sweets, an orange, brass candle stick with candle and a red and white checked cloth. In December 2011 the Church adopted the theme of “12 Days of Christmas”. The group was given “Ten Lords a Leaping” as a subject to interpret. 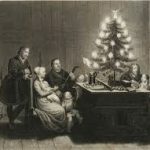 The carol (originally French) is based, some say, on reminding Christians of their faith, with Ten Lords a leaping representing the Ten Commandments. In any event, whether true or not, we had lords a leaping in abundance. 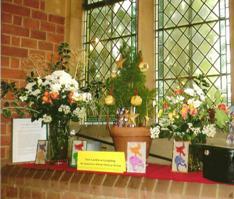 The display was inspired by a members daughters book featuring the 12 Days of Christmas. On the display there were ten colour silhouettes of top-hatted men leaping about, an actual top hat and cane and an old hat box, a variety of colourful festive flowers in glass vases with foliage and a mini decorated Christmas tree. Who knows what idea 2012 will bring! 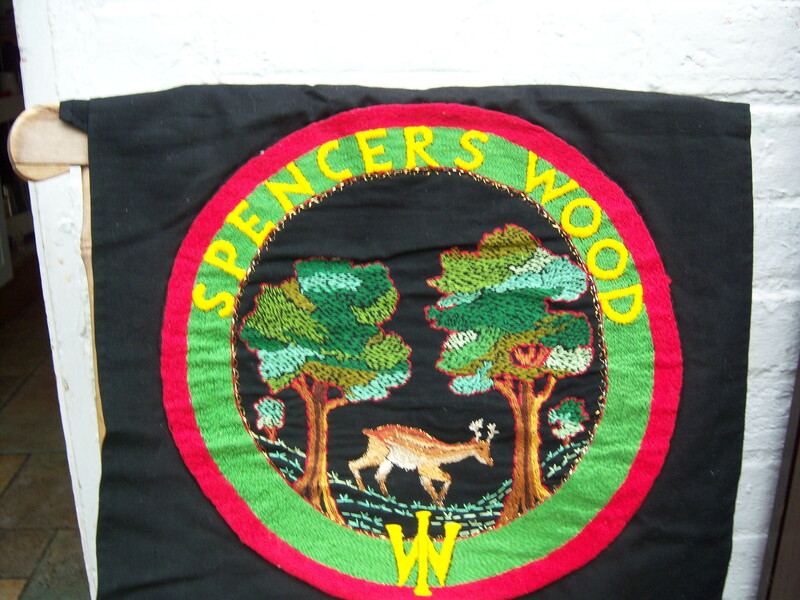 Celebrations for Christmas in the past are recorded in archives of the Spencers Wood Local History Group. In the nineteenth century there was a workhouse in Grazeley, where destitute men, women and children were housed in return for hard work with sparse food. Before 1834, Christmas Day brought a treat when everyone was given a day off work and a special meal. Each adult had roast beef, plum pudding, ‘best’ cheese and a pint of porter (dark beer). In 1834, however, the Poor Law Union ruled that the inmates were not to have any ‘spiritous or fermented liquors’, unless for special health reasons. Some workhouses disregarded this, especially after Queen Victoria married Prince Albert and new Christmas festivities were introduced into Britain. 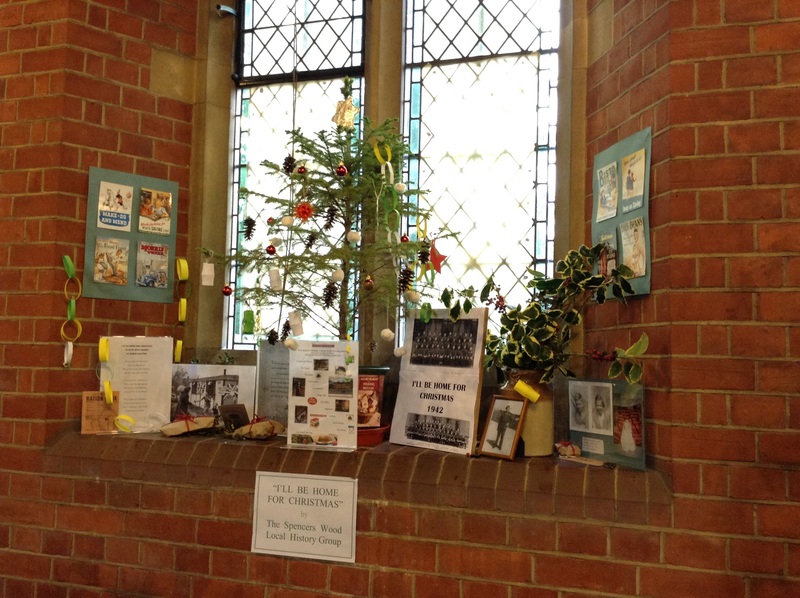 Christmas trees and holly became traditional decorations, even in the workhouse. It is not known how much conditions at Grazeley matched the sentiments of the Victorian poem: ‘It is Christmas Day in the workhouse and the cold, bare walls are bright, with garlands of green and holly and the place is a pleasant sight’. Local schools seem to have always celebrated Christmas before breaking up for a few days’ holiday. At the Sir Charles Russell School in Swallowfield, the Headmaster, his wife and some of their friends put on an ‘admirable’ concert in December 1896. The Spencers Wood School (in the present Library building) generally arranged a treat for each child. In 1891 they were given picture books, prayer books, or a picture card. The next year, the children were sent out to run around the playground and when they came back indoors they were presented with bread and butter and cake to eat immediately. 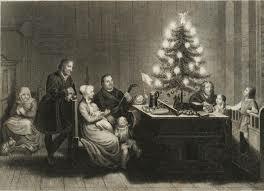 Then they had to seek out some sweets, and were given a Christmas card, a pair of warm knitted cuffs and an orange to take home after they all sang a hymn. The gifts would have been appreciated in the poor village homes that many of the children came from. The Christmas gifts of clothing, some food, and toys for the ‘babies’ (5-year-olds) continued and by 1898 the celebrations also involved a Christmas party with singing, a flag drill and games before the Christmas tea. The first Christmas tree was set up in the hall in 1903 and decorated with gifts. The Sunday Schools at the churches and chapels always arranged Christmas gatherings as well as carol concerts. In the 1930s it was usual for St Michael’s Sunday School to host parties for one hundred children in the Village Hall. During World War Two (1939-45), special efforts were made to devise activities and entertainments for all the children including the evacuees who were away from their homes in London. Staff of the village schools helped local residents to rehearse and present concerts, plays and special meetings to occupy the children. It was noted that friendships developed and flourished because of these efforts. After the war, the traditions continued. Lambs Lane School performed a nativity play each year and a concert to which all parents were invited. These were so popular that the audience was too large for the school hall, and in 1965 the concert was held in the Village Hall. It was not only school children and their families who celebrated Christmas together. In the 1970s and 80s, postmen who had worked long hours to deliver the mail from the Spencers Wood sorting office would have sherry and mince pies before going home on Christmas Eve. Also, it was traditional for groups of carol singers to walk around the village visiting other families to greet them with ‘here we come a-wassailing…’, spreading goodwill at Christmas.